Home | Vitamins | Letter Vitamins | Vitamin B | Vitamin B-2 | Vitamin B-2 100 mg. Although Riboflavin (Vitamin B-2) is found in plenty of breakfast cereals as an additive, you may want to supplement your Vitamin B-2 intake with these high-quality tablets to ensure that you are getting your Daily Value. Each coated caplet makes it easy-to-swallow and provides 100 mg. of Riboflavin (Vitamin B2). Gluten Free. No Soy. Vegetarian. Other Ingredients: Dicalcium Phosphate, Vegetable Cellulose. Contains <2% of: Silica, Vegetable Magnesium Stearate, Pharmaceutical Glaze. Vitamin B-2 100 mg. is rated 4.1 out of 5 by 10. Rated 5 out of 5 by Cd1234 from Excellent product. High quality product for a reasonably price! Shipping didn't take long to arrive. Rated 1 out of 5 by yi from Vitamin B-2 100 mg color changed I brought two bottles of Vitamin B-2 100 mg, then I found the pill color was changed and pill effect is useless.May I can change another? Rated 5 out of 5 by Wendy from Excellent product My family uses this product, and we also recommend friends to use this brand name product. 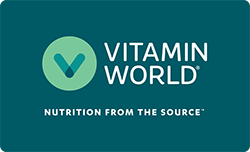 Our friends are Vitamin World members now. Rated 5 out of 5 by FOLABQ from Fast good service and product My order was easy to place on the website, a nice discount from purchasing it at other pharmacies or stores, and arrived in record time. I have been ordering Vitamin B-2 from Vitamin World for years, and I have always been extremely satisfied. Rated 4 out of 5 by Bargin Billy from Lot Of Value For The Mojneyg Considering the fact that you not only get double the vitamin or other product, in addition to free shipping directly to your door, you are ahead all the way considering Vitamin World's superior vitamins and minerals.